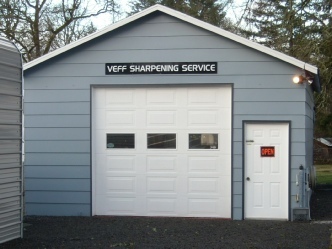 My name is Tom Veff and I am the owner/operator of Veff Sharpening Service in Oregon City, Oregon, established June 1, 1989. 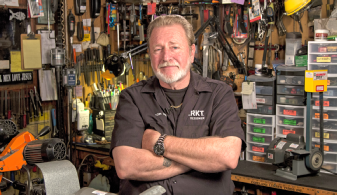 My love of knives and cutting tools started when I was a young boy. I started sharpening to earn money at age 9. I found that I had a natural talent or gift from God to sharpen knives. As a young man of 19, I entered the meat industry and was a journeyman meat cutter and meat department manager for 20 years. I was quickly chosen to be the knife sharpener in every meat market I worked in. I also spent a lot of my free time customizing knives of all types. I loved to reshape blades and handles of knives to make them more functional and comfortable to use. I consider myself an ”edge-ologist” because I have spent the majority of my life studying cutting edges. I produce a very highly polished, surgically sharp convex edge. A convex edge is stronger than other edges and the super smooth polished edge reduces friction and drag during the cutting process. It also outlasts other edges. Sharp is relative to what you have experienced. I take great pride and joy in what I do and my goal is to introduce you to a new concept of sharp. As stated before, I believe that sharpening well is a gift. It takes not only an understanding of cutting edges, but also an eye and a feel for it. I also design knives. In 2003, Kershaw Knives introduced 3 of my knives, the Majesty #2314, the Kaper #2300 and the skeletonized Kaper . These models were discontinued for 2009. I still have some of them available for purchase. The Majesty #2314 is a serious gut hook skinning knife for the discriminating hunter. The Kaper #2300 and the skeletonized Kaper are excellent for general purpose use as well as caping. On February 1, 2006, Columbia River Knife and Tool (C.R.K.T.) introduced my serration design on a number of their knives. They are called Veff-Serrations and they are protected by United States design patent #US D559,939 S. C.R.K.T. has exclusive license to produce Veff-Serrations on knives manufactured by them. Veff-Serrations are also available directly from me should you desire them on your favorite knife. They are unlike traditional serrations which are usually small scallops oriented at 90 degrees to the blade cutting edge. Veff-Serrations are wide and cut at about 50 degrees to the cutting edge. The resulting cutting points bite instantly and dig deep upon contact while the large surgically sharp valleys slice smoothly and effortlessly. Unlike traditional serrations that tend to snag and stick while cutting rope and similar material, Veff-Serrations slice through cleanly and easily. This produces dramatically improved cutting ability on rope, webbing, strapping, hoses, leather and vegetation. Veff-Serrations have been extensively tested and have proven to be the most efficient and effective serrations to date. In January, 2008, Columbia River Knife and Tool introduced another of my designs. It is called the Veff M.U.K.. (Marine Utility Knife). It is a reasonably priced all purpose knife. 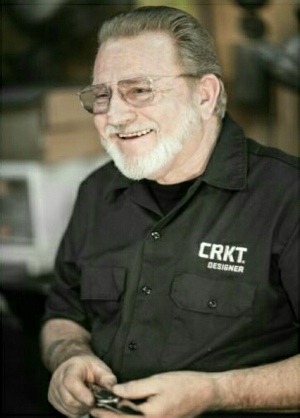 For 2010, I designed the CRKT Veff Sharp™ to be the ultimate portable multipurpose field and bench sharpener. The Veff Sharp™ is effective on most serrations and does not create egg-shaped serrations as tapered sharpeners do. It works equally well on gut hook knives and seat belt cutters. 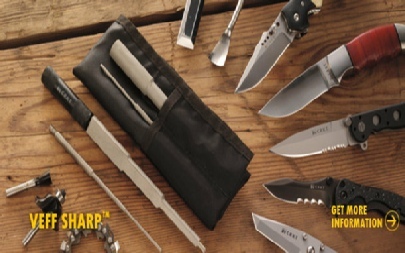 It is a versatile and indispensable tool that belongs in every workshop, tool box, tackle box and hunter's pack. 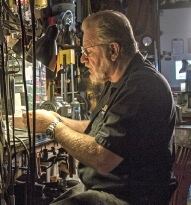 It allows the user to keep a keen edge on all types of cutting tools including serrated and plain edge knives, wood chisels, wood carving and lathe tools, router bits, punches, scissors and saw chain. I sharpen most items found in the home and shop as well as many specialty items. I offer prompt turn around mail order service throughout the United States. Please call for pricing and details prior to shipping.